If you are very new to programming with you can start with introduction to c programming lesson. This particular lesson deals with different types of variables and constants used in c programming. The following is the list of allowed characters in c programming. Constants, Variables and Keywords The alphabets, numbers and special symbols when properly combined form constants, variables and keywords. A constant is an entity that doesn’t change whereas a variable is an entity that may change. In any program we typically do lots of calculations. The results of these calculations are stored in computers memory. Like human memory the computer memory also consists of millions of cells. The calculated values are stored in these memory cells. To make the retrieval and usage of these values easy these memory cells (also called memory locations) are given names. Since the value stored in each location may change the names given to these locations are called variable names. Consider the following example. Here 3 is stored in a memory location and a name x is given to it. Then we are assigning a new value 5 to the same memory location x. This would overwrite the earlier value 3, since a memory location can hold only one value at a time. This is shown in Figure. Since the location whose name is x can hold different values at different times x is known as a variable. As against this, 3 or 5 do not change, hence are known as constants. 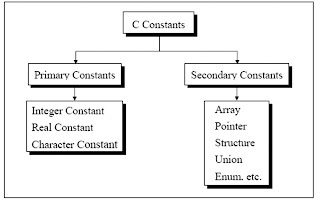 These constants are further categorized as shown in Figure. Regarding constants in c programming further discussion will be made in the next posts.Just not to miss the lessons subscribe to the feed.